I’m considering this a drama. It’s a heavy, filmed in a way where you feel the heat and dryness in your throat. But it’s not overwhelming. 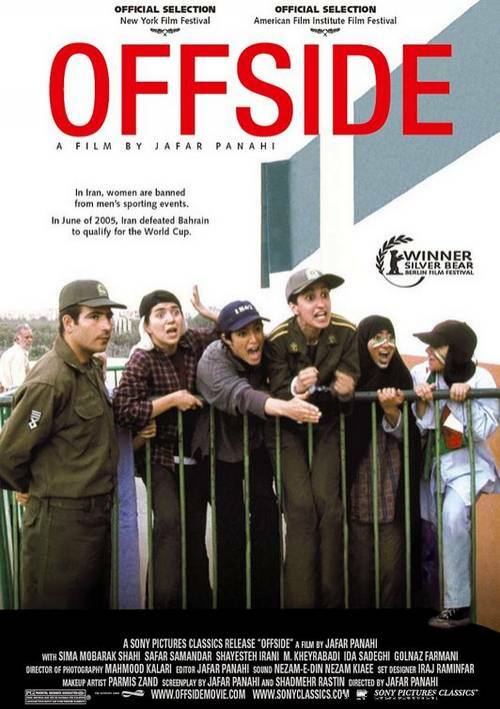 Directed by Jafar Panahi, “Offside” is an Iranian movie about a bunch of girls trying to sneak into a world cup qualifying game, but are forbidden by law to watch it. The law was created to protect them, shielding them from the violence and the bad words that might hit them straight in the face. Obviously, as a white girl living in a pretty liberal part of Canada- I think that law is stupid. That’s my cultural eye. That being said, that didn’t stop me from enjoying the movie. The movie was inspired by the Director’s daughter, who decided to attend the game regardless. It revolves around a small group of girls and their stories for this speciic day. They don’t give names to the characters, but you definitely see the personalities shine. Based in Tehran, you get to enjoy the city and the culture that it also has to offer. Girl number is on a bus, she’s disguised herself as a boy. Most of the boys know she’s a gal, but they don’t care. Once at the stadium, she convinces a reluctant ticket vendor to sell her a ticket at a ridiculous price. It’s at the security gate where she is spotted and then put into a holding pen as punishment. Once in the pen, she meets a bunch of girls who had various reasons for doing what they did. The guards watching them, like the boys on the bus, don’t really see the point of why theses ladies are being held. They’re just watchmen, directed by higher people in command to do their job (national service). One boy, in particular- a boy from Tabriz, would really just like to be back at home on his farm. I think that helped build a good connection between the girls. Because later on in the film, when given the chance to escape, one girl chose to come back, in fear that his guy would get in trouble. The movie ends with the game being a victory, with fireworks, and with the girls being put into a bus to be delivered to the guards headquarters for further punishment/ calling parents. Through out this bus ride, you learn a bit more about the female characters and why exactly they chose to break the law and do what they did. I really liked the build up toward the end of the move, and I really enjoyed how they finished it off. Even though you didn’t have a direct name for the characters, you didn’t lack anything in particular. They were strong and vibrant, and like any good story, you learn more about them as the movie progressed. I also liked the character who played the farm boy. He had this particular scene at the end of the movie, where he was just simply getting drinks for these girls who were stuck in the bus. It was a short and funny scene, but it stuck with me for a while after seeing it. This is a definite Wednesday night movie. Go buy some good food and enjoy both.